Tel Aviv student Iftach Gazit has designed food bags that can be added to the laundry cycle to cook dinner at the same time. The Sous La Vie bags, which were designed as part of Gazit's Industrial Design course at Bezalel Academy of Arts and Design, rely on the sous-vide method of cooking. This immerses vacuum-sealed food in hot water over a long period of time, and ensures meals are evenly cooked and stay moist. Gazit's bags are made from waterproof Tyvek paper, which keeps the food soap-free. They have an inner sealed plastic bag to stop leaks. 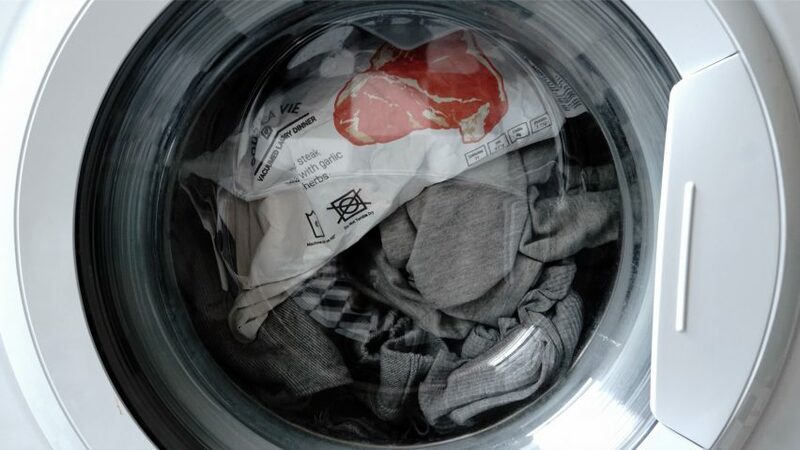 "Instead of following a sous-vide recipe and cooking a piece of meat at 58˚C for two and a half hours, just set your washing machine to 'synthetics' for a long duration programme," explained the designer. "Cooking vegetables? Set your machine to 'cotton' for a short duration programme." Gazit's prototype versions of the bags feature fully packaged meals and sides, with recommended washing temperatures and nutritional information laid out in the style of clothes labels. The designer was prompted to create the packaging after researching the rise of convenience food such as the TV dinner. According to Gazit, these surged in popularity during the Second World War when larger numbers of women took jobs and had less time for the demands of house work. He also had the needs of homeless people in mind, having read stories about 24/7 laundromats acting as a safe haven for those living on the streets. "It can be humorous to think of cooking your food in the washing machine as a new dinner topic, or a Damien Hirst-style restaurant filled with washing machines instead of pills," he added "But humour is not the point." "Instead, the Sous La Vie laundry-dinner serves as a reminder of lost homes and (the American) dream," he continued. "The laundry dinner is not intended solely for the homeless, but much rather for us all: a product that reflects on our taste, our economic ability and our culture." Other proposed alternatives to traditional methods of preparing food include Bistro in Vitro – a virtual restaurant that served up lab-grown conceptual dishes – and a prototype countertop 3D printer that would produce meat on demand.